Papa Rey has done it again! 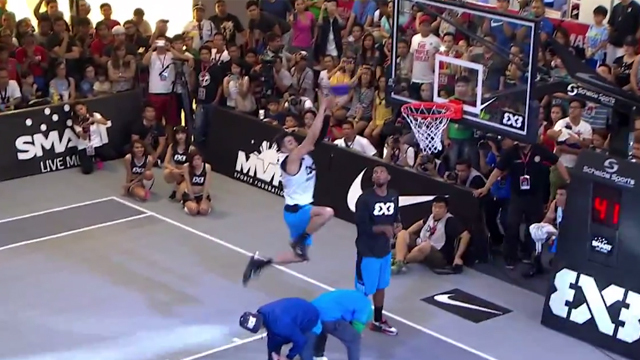 Rey Guevarra once again proved he's one helluva dunker. The Meralco Bolts forward did so by successfully defending his crown at the FIBA 3x3 Manila Masters Slam Dunk Contest, held inside Robinsons Place Manila yesterday. Congratulations, Papa Rey! It was certainly not a walk in the park though; Rey had to defeat one of his slam-dunking idols in the final round, Porter Maberry. Standing only 5'5," Porter is proclaimed as the world's shortest pro dunker—yes, even shorter than former Clipper (and kryptonyte to Dwight Howard's superman) Nate Robinson and the Star Hotshots' slam-dunking guard, Justin Melton (both standing at 5'9"). His moniker "What's Gravity" is certainly well-deserved. So, how did our pambato beat this springy aerial dynamo?